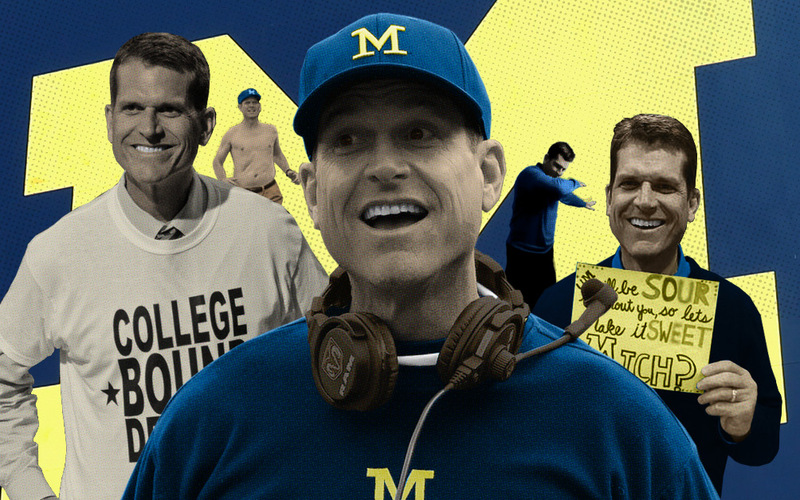 Since returning to college football last January, Jim Harbaugh has been a whirlwind of khaki-covered activity. He has advocated his own diet plan (Hello, Vitamin Steak). He has hung out with celebrities (Hey, it's Derek Jeter!). And now he'll cap the season by spending national signing day with Jeter, Tom Brady and Ric Flair. But the best stuff, the purest Harbaugh, has come on the recruiting trail. Thank you so much for the kind wishes @CoachJim4UM, best of luck this year at Michigan! One month after signing a top-40 2015 recruiting class, Harbaugh tweeted a shoutout to Judge Judy on the extension of her TV show. Judge Judy, who responded to Harbaugh's tweet, doesn't have a connection to Michigan or Harbaugh. But, hey -- game recognizes game. Spring is prom season, and outrageous prom proposals that go viral are all the rage. So when Boss Tagaloa, a 2016 defensive tackle recruit from Concord, California, made a sign seeking a prom date, Harbaugh answered with a sign seeking an ESPN 300 prospect. Tagaloa will announce his decision on national signing day, and Michigan is in the running. The good news for Tagaloa: A Michigan uniform doesn't require a cummerbund. Like Lord Byron and Shakespeare, the ability to write about the ways of the heart comes to only a few gifted people. In this case, Harbaugh's son, Jay, composed a note to ESPN 300 tight end Naseir Upshur's girlfriend. Alas, some love goes unrequited. Upshur eventually committed to Florida State. However, "You will not talk your way into success." will go down as words that touch romantics across ages. Harbaugh has irked coaches in the SEC and elsewhere with his use of so-called satellite camps -- football camps hosted in another state. Harbaugh's response to USA Today: "In my America you're allowed to cross state borders." Beyond the controversy, Harbaugh dealt with the summer heat like he would any game day -- Michigan baseball cap. Khakis. No shirt. Wait, he usually wears a shirt. In June, recruits typically travel to campuses in hopes of impressing coaches and landing scholarships. But camps at Michigan were a little ... different. Citing a desire to see athletes in different settings other than playing football, Harbaugh had bounce houses, soccer, dodgeball and an obstacle course. On the trip above, Harbaugh went for ice cream with prospects and took in a summer stroll through Ann Arbor with a milkshake in hand. Nothing says "devote the next three to four years of your life and education to a school" like messages in frosting. This Michigan birthday cake went to three-star linebacker Jonathan Jones. Whether it was the icing on Jones' recruitment remains to be seen. He remains uncommitted, but he is still considering the Wolverines. Luckily, the Michigan staff is already employed and won't be applying for a mapmaking or geography-teaching positions after its poor representation of the state of Texas was sent, via cake form, to ESPN 300 defensive lineman (and Texas native) Jordan Elliott. Despite the, um, shaky outline, Elliott committed to Michigan five days later. Of course, in a case of having the cake and eating it too, Elliott eventually decommitted from Harbaugh and Michigan. Did the cake go bad? The Dab has officially replaced the Whip/Nae Nae as the nation's current dance craze, and now everyone from national championship coaches Dabo Swinney and Nick Saban to Super Bowl QBs is Dabbing. Never to be outdanced by anyone, Harbaugh joined the fray. During an in-home visit to three-star running back Kingston Davis, the Michigan coach gave the world a Christmas-themed Dab in front of Davis' Christmas tree. When a recruiting dead period ends, it starts an all-out launch on recruits. And getting to a particular recruit at the earliest moment can leave a huge impression. When the most recent dead period ended at 11:59 p.m. on Jan. 14, Harbaugh arrived at kicker recruit Quinn Nordin's Rockford, Michigan, home for a sleepover at 12:01 a.m. Harbaughstayed the night with Nordin and his family and rode to school with Nordin the next day. When Nordin departed for Ann Arbor for a Michigan visit, it was Harbaugh riding shotgun with him. In recruiting, when challenged by someone saying, "I bet you can't climb that tree in khakis and a windbreaker," you better do it. Harbaugh went to Los Angeles to visit ESPN 300 athlete David Long. Long's younger sister asked Harbaugh to climb a tree in the family's front yard. The Michigan coach never made it to the top of the tree, but that didn't seem to bother Long. He committed to Michigan two days later. Once he made it out of the tree and inside Long's home, Harbaugh was asked, "How's business?" in reference to hip-hop mogul DJ Khaled's Snapchat escapades. Harbaugh and four Michigan assistants then gave their assessment of just how good business has been. A day after his tree-climbing business meeting at Long's home, Harbaugh returned to the Bay Area to visit football powerhouse De La Salle (Concord, California) and ESPN 300 tight end Devin Asiasi and his old pal, Boss Tagaloa. Both Asiasi and Tagaloa will announce their commitments on signing day. Another sleepover? Another sleepover. With signing day two weeks away, Harbaugh was in Phoenix visiting Connor Murphy. Harbaugh and the Murphys have history. Harbaugh recruited brother Trent Murphy to Stanford, and during an in-home visit then, the Murphys had to rush to the hospital for the birth of another child. Harbaugh ended up babysitting a young Connor. Now a three-star defensive end, Connor got another night with the Michigan coach, calling it a "Netflix and chill" kind of night. Hopefully, in true sleepover fashion, there were s'mores, ghost stories and prank calls. Now, with just days to go, Harbaugh is poised for a top-five recruiting class with double-digit ESPN 300 recruits and a chance at No. 1 overall player Rashan Gary. No word if a cake, misshapen or otherwise, has been sent to Gary. Can Clemson deliver on Dabo's pizza promise?